For the most important outfit of her reign and what was essentially her second wedding dress, Queen Elizabeth returned to the man that made her first and would shape her look for decades to come: Norman Hartnell. 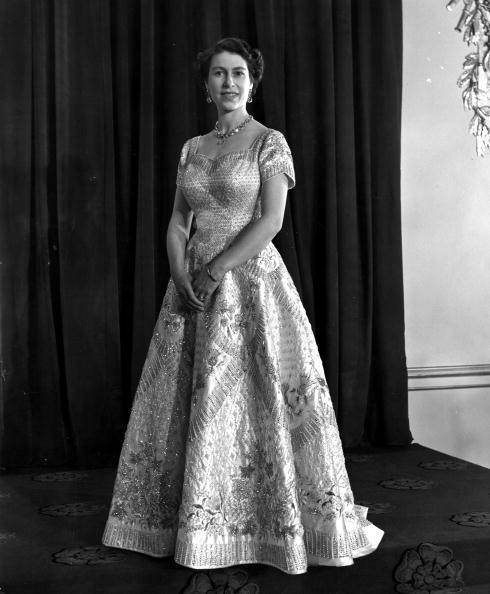 With instructions to create a regal gown for the ages, Hartnell began a back-and-forth design process with the queen. 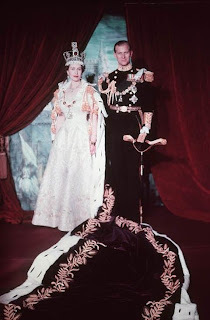 Pure white was out in favor of color; form-fitting sheaths were discarded in favor of less body-conscious options; simplicity was rejected in favor of symbolism from around the United Kingdom, which was in turn rejected in favor of symbolism from all around the Commonwealth. After diligent research on past coronation gowns and consultation with the symbolism authorities (during which he was forced to learn that the Welsh leek could not be substituted for the daffodil, no matter how much prettier he thought it might be), and nine proposals to the queen, Hartnell had a design. 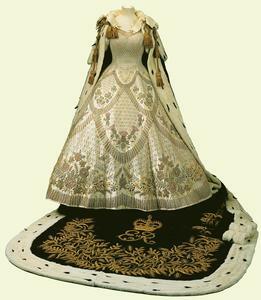 The coronation gown was created from white satin made from fibers from the silk farm at Lullingstone Castle. Short sleeves and a heart-shaped neckline tapered down to the monarch's tiny waist, with the full skirt flaring out from below and ending in a slight train at the back. On to this base of a dress came the real star of the show: the embroidery. Seed pearls and crystals created a lattice-work background for floral emblems in pastel silks and gold and silver threads. Every country in the Commonwealth at the time was represented: the Tudor rose for England, the thistle for Scotland, the leek for Wales, the shamrock for Ireland (despite the fact that by that time only Northern Ireland remained), wattle for Australia, the maple leaf for Canada, the fern for New Zealand, protea for South Africa, lotus flowers for both India and Ceylon, and Pakistan's wheat, cotton, and jute. Unbeknownst to the queen, a single four leaf clover was added on the left of the dress, just where her hand would brush throughout the day. In order to carry and distribute the weight of all the embroidery, the dress was lined in taffeta and three layers of horsehair. After eight months of work, the gown was delivered to the queen three days ahead of the coronation; she declared it to be "glorious". 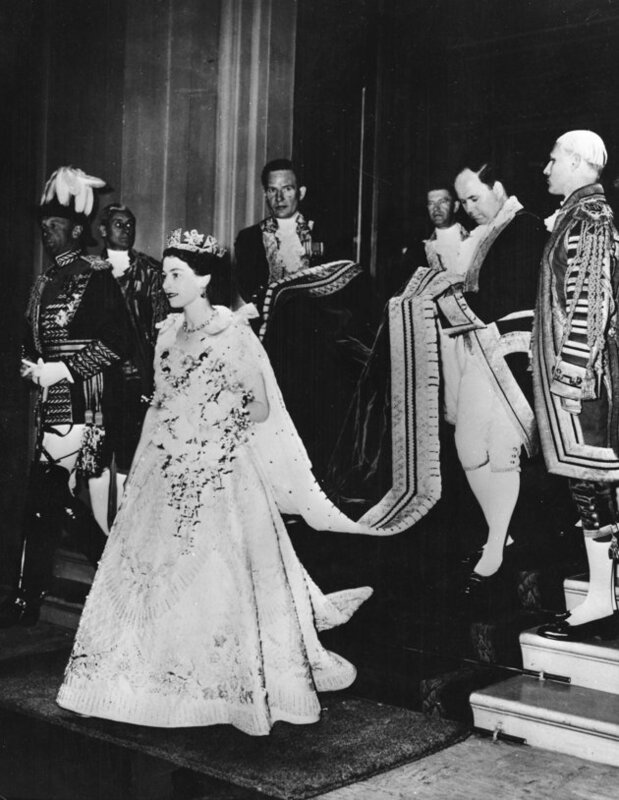 Queen Elizabeth actually wore her glorious gown six more times after Coronation Day: for receptions at Buckingham Palace and the Palace of Holyroodhouse as well as Parliament openings during her coronation tour in New Zealand, Australia, and Ceylon in 1954 and Canada in 1957. The queen accessorized her dress with Queen Victoria's "coronation" necklace and earrings, commissioned by Victoria in 1858 and worn by queens at each coronation since Edward VII's in 1902. She departed for the coronation carrying a bouquet and wearing the Robe of State at her shoulders and the George IV State Diadem on her head. She returned in the Robe of Purple Velvet plus the Imperial State Crown and other pieces from the crown jewels - more on those later. Queen Elizabeth's robes were among the other garments commissioned for the coronation. Norman Hartnell also created a simple pleated white linen covering added over the gown for the anointing. Both robes were new and created with hand-woven velvet made from silk from the same silk farm as the dress. The 18 foot crimson Robe of State was lined in ermine with gold lace and filigree work around the edges. It weighs more than 15 pounds and was worn arriving to the coronation; this is the robe used by the queen for each State Opening of Parliament. 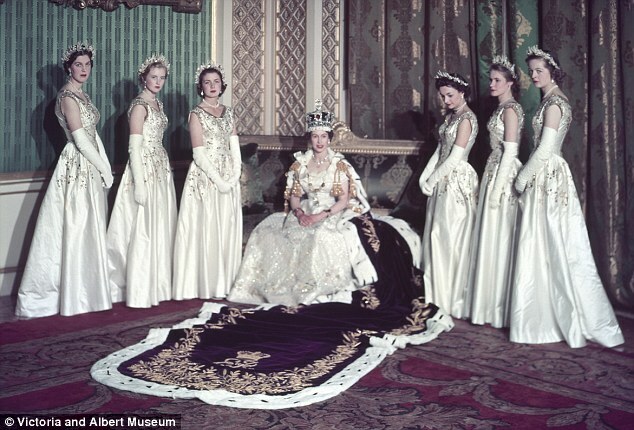 Special to the coronation, the 21 foot Purple Robe of Estate featured an ermine border and cape with a white silk lining. 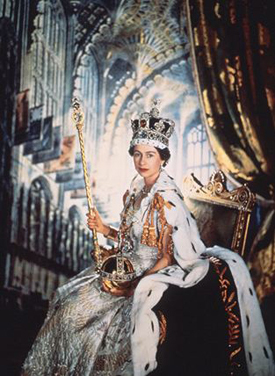 The Royal School of Needlework put 3,500 hours into the gold embroidery. 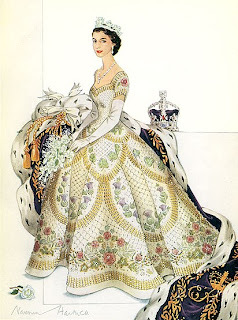 The queen departed the coronation wearing this robe, and it is the one that features in all of the official photographs. Hartnell was also commissioned to make the outfits for the queen's 6 maids of honor, all single aristocratic girls who were in charge of managing and carrying the heavy train via invisible silk handles. Smelling salts were sewn into their gloves as their dresses featured tight waists, the ceremony was long, and the pressure was high. Each wore white satin gowns with pearl blossom and golden leaf embroidery with gold tissue wreaths of forget-me-nots, freesia, and heather. They were the perfect accompaniment to the star of the show and her magnificent gown. Do you think Hartnell succeeded in his mission to create an iconic gown?